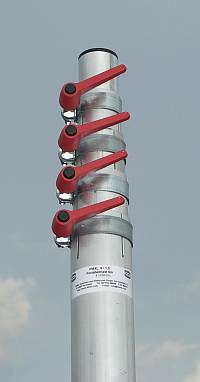 The telescopic masts are manufactured from sideways slotted aluminum tubes; the mast can be extended to any length and securely locks into place by means of a massive clamp. The maximum allowed extended length is marked by a color ring approx. 20cm before the end of each tube. There is no fixed stop which makes it advisable to approach the marking slowly when extending the telescopes. These masts are ideally suited for portable applications due to the low weight and the telescopic mechanism. When setting up the mast please pay special attention to the clamping length; the clamping length of the mast must be at least 1/6th of the extended length, or at least 1 meter at the minimum. When extending the mast more than 6 meters measured from the uppermost clamping point additional guys are mandatory. The tubes are made of weather-proof aluminum alloy. The tubes are tapered by 5mm and the tube thickness is 2mm. Please refer to the following table for weight and dimensions. The stated additional forces refer to a horizontally applied force at the tip of the extended mast - without guys and a mast clamping length of 1/6th. The calculation includes the inherent load at a wind speed of 50km/h (which is equivalent to a wind force of 7). Option for the portable masts. Usually these masts require a flat or socket wrench, with the quick release clamps you can raise and lower the masts without any tools. Even with limited space these quick clamps can be easily used, because the lever can be adjusted at any position. Just pull out and release the lever, the strong spring latches the lever at the desired position. In contrast to the usual tommy screws (star grip screws) the quick release clamps allow for secure tightening of the clamp without using too much force. How many quick release clamps are needed for a mast? The table above shows a column "Number of Segments". The particular mast requires this number of segments minus one clamps. Example: The mast "PMXL 6/1.5 (18300.6XL)" consists of five segments, you would need four quick release clamps. Of course older masts can be retrofitted with these quick release clamps, as well as any other mast which uses M8 screws. Pipe clamps for portable masts etc. All clamps use an M8 screw, so the quick release clamps 23046 can be used as well. Smart construction which finally avoids that the guy wires and antenna cables get entangled. That happens most often at the topmost guying. Solid metal disc, the gap for the cable guide is wide enough (25mm) to accomodate most rotor connectors. The same product can be used to guy a mast in several heights: included in the shipment are bushings for 50, 40, 30 and 20mm mast diameter. Of course the mast can still be rotated ín the guy clamp. light model, adjustable, dismountable, yellow zinc galvanized, for smaller portable masts up to 50mm diameter, span length 150mm, width of base 220mm, 500mm long, incl. screws. heavy model for larger antennas, tiltable, hot dip galvanized, mast diameter 25-50mm, span length 380mm, with sheet metal to protect the mast, carrying handle, 180mm wide, 480mm long, incl. screws and wingnuts, weight 6.5kg. Mast tripods are well suited for portable applications because of the ability to quickly achieve a temporary installation. The tripods are folded together in one move without any tools. When collapsed the dimensions are very compact; the diameter of the large tripods only amount to 250mm when collapsed. The masts are fixed within the tripods by means of two large tripod heads and secured by star head screws. The tripod heads as well as the legs are made of aluminum. 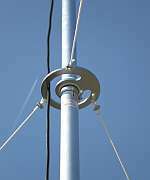 Download installation instructions for mast tripods. For telescopic masts with three guying thimbles made of fibre-glass reinforced plastic. The clamps attach themselves to the tapered section of the mast thus enabling to rotate the mast even when fixed with guys and pegs. Used to erect the tripod on sandy soil and to equalize the tripod up to max. 100mm inclination. The mount size is 240 x 120 mm, the plates are made of aluminum and come in packages of 3 pieces per set. Compact, heavy steel tripod for masts from 40 to 55mm diameter. Collapsible in one move, well suited for portable applications - i.e. just drive the car onto one of the tripod legs (park-on mount)... Made of galvanized steel. New model with modified clamping device: features now more clamping space and a slot, in addition one leg can be height adjusted. Collapsed dimensions 55x18x18 cm, weight 15 Kg. Mast base for 4 paving stones 40 × 40cm or 50 × 50cm, for tubes with diameters from 48 to 55mm Ø. Weight c. 6.8kg, galvanized. Lightweight aluminium telescopic masts by Diamond with a smart mount head. Extended height 450 or 600cm. 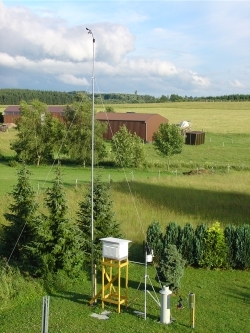 The mast has a versatile head mount which allows mounting of various vertical or directional antennas. Further you can install Diamond cable sets or other N or PL sockets, so you can install mobile antennas. And when you remove the mounting bracket you have a 1/4" thread used to mount a camera! The well known shortwave portable antenna 'Buddipole' has an interesting mast which is suitable for small antennas. Two masts with 290 or 550 cm are available, collapsible to 66 or 99 cm respectively. The tripod has a collapsed length of 66cm. Due to the light weight this is a very easy to transport mast solution. The mast has a 1/2′ NPT thread on top (cone shaped). Required is the tripod article number 11420.BPT and one short (11420.BM) or one long mast (11420.BML). Or both?